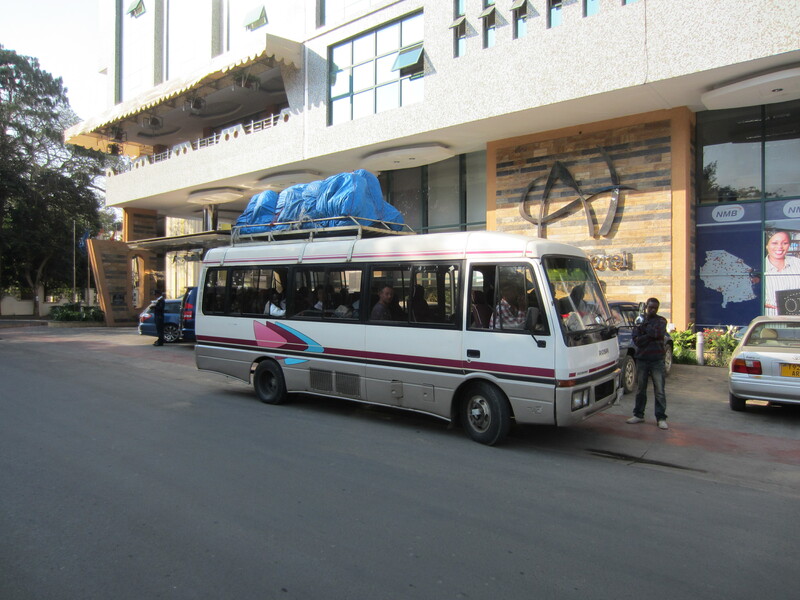 Shortly after making my final blog post the Team Kilimanjaro bus arrived , a clapped out tourist bus from the eighties. As we stepped up into the vehicle I was greeted by twenty three smiling faces packed in like sardines. 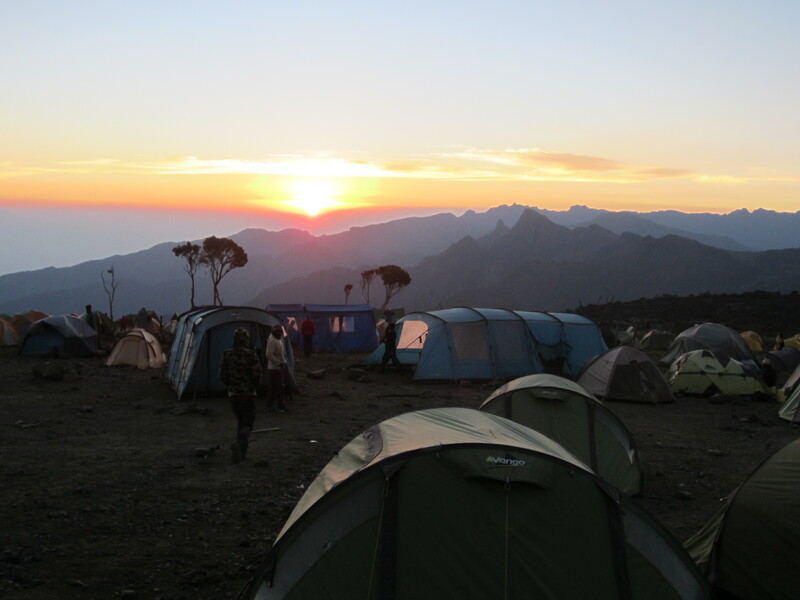 At this point it struck me what a great name our tour operator had, ‘Team Kilimanjaro’, however hard one finds the climb and in spite of whatever training and preparation one makes all those reaching the summit have got there as part of a team effort with numerous porters having hauled tents, bags and food to establish the many camps. The trip from Arusha to Machame gate takes 90 minutes, there’s a buzz, an air of excitement amongst the porters, cooks and guides they chat and read news papers, the head guide sits with us, the valued clients, I can’t help but think that he’s silently evaluating us, trying to decide who’s capable of reaching the peak, who’s not trained, who had too many Serengetti Lagers at the Mango Tree bar last night? It feels like it must be over 30 degrees in the back of the bus, yet our guide pulls on heavy mountain jacket that wouldn’t look out of place on a polar expedition, this seems odd at the time but later it becomes obvious that Kilimanjaro has developed it’s own class system with guides, assistant guides, cooks, assistant cooks and porters. 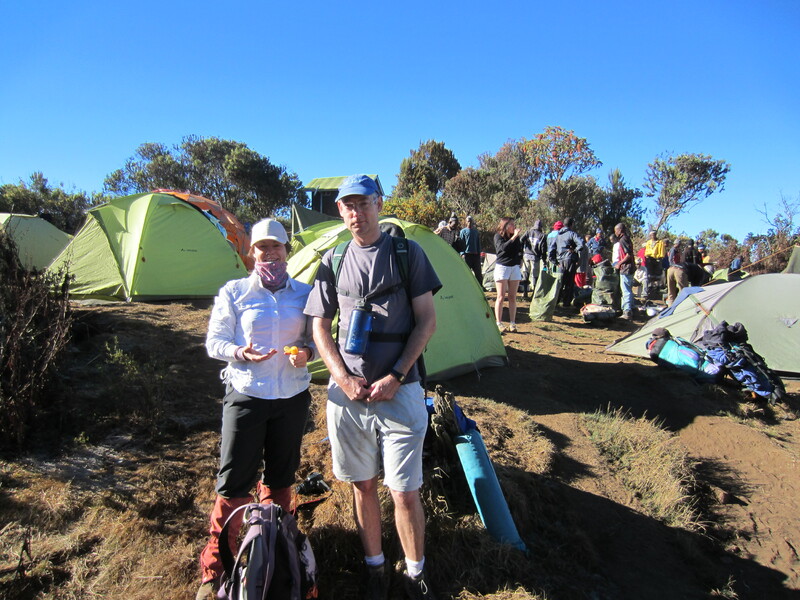 The expensive mountain equipment required on summit day are the badges of office for the guides and their assistants. That morning my climbing buddy and I had experimented with a new drug, Diamox or Acetazolamide. A pharmaceutical in which we had placed great faith, our hope, that it would help us overcome the effects of altitude and improve our chances of summiting. 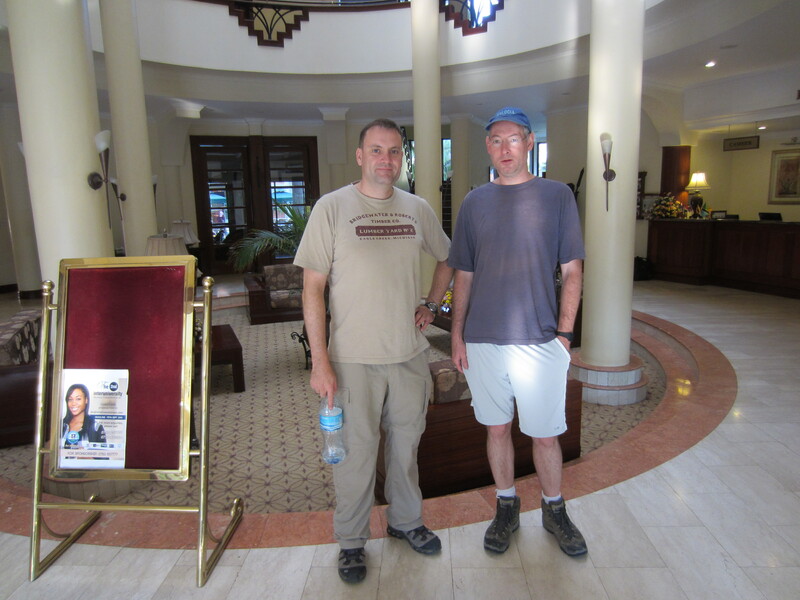 As our driver negotiated the numerous speed bumps that punctuate the road between Arusha and Moshi we became painfully aware of the primary side-effect of Diamox, that of elevated diuresis. With a bladder that was as taught as a snare drum we were more than happy to break our journey at a small local cafe. The cafe provided us with our first opportunity to converse with our fellow climbers, we would be a team of six. It seemed somewhat incredible that it would require a team of 26 porters, cooks and guides and the best part of a week to get the six of us to stand briefly on the summit of of this awesome mountain. Numerous other busses have chosen to break their journey at this popular rest stop and the climbers chat excitedly in English and German, I feel somewhat under dressed in shorts and T-shirt, as other climbers look pristine in their best, North-Face, Rab, Mountain equipment etc. Everyone seems to have brought expensive DSLR, I immediately regret not taking my new Canon and opting instead for the lightweight option of a compact. The cloud cover is low and as we continue our journey towards the gate the guide explains that Kilimanjaro is a shy mountain, and that it’s uncommon to have un-interupted views of the mountain from the plains, this somewhat shatters the illusion of so many iconic pictures of Kili with elephants grazing the plains in the foreground. 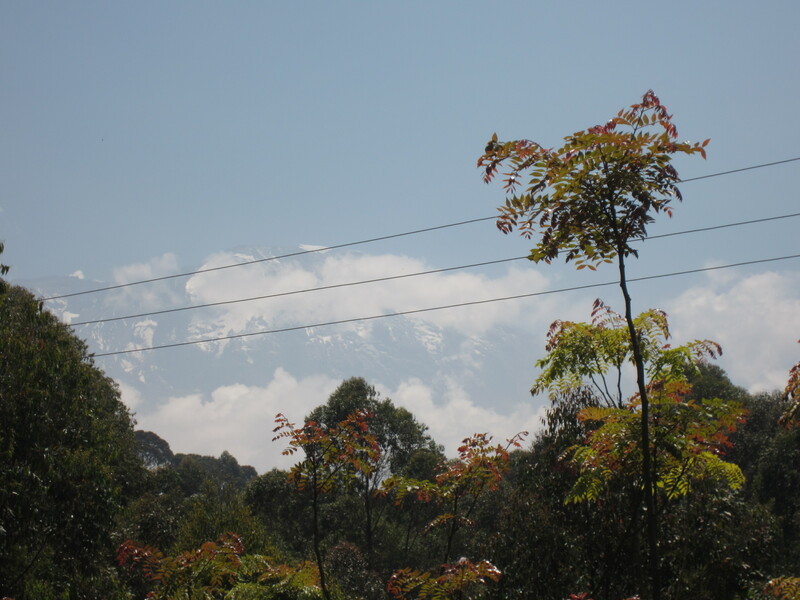 Suddenly we get our first glimpse of Kilimanjaro, the white snowcapped peak appears to be magically floating above the clouds, we are all instantly thrown into state of excitement, despite the poor visibility and bad angles we all attempt our first photographs of the mountain. The peak seems unfeasible high up, I have a quite introspective moment of self doubt that I choose not to share. As we approach the mountain the road begins to steepen and the diesel engine of our bus begins to labour, we progress through banana plantations that carpet the lower slopes and barefoot children run alongside the bus and wave and smile happily I feel somewhat humbled by their cheerfulness, despite the poverty they hold no resentment to the rich foreigners that have come to climb their mountain. 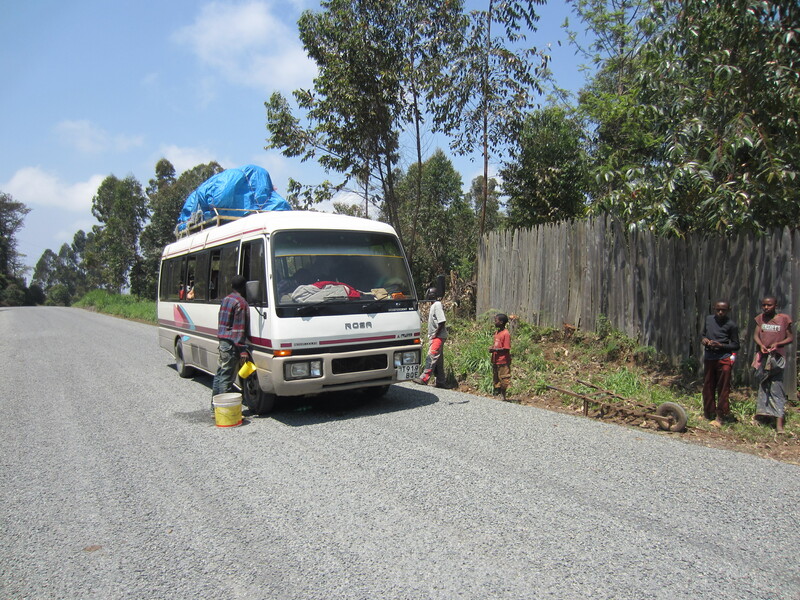 The road steepens and despite the drivers best efforts the overladen bus struggles with the gradient, eventually the hill is too much for the bus and the engine overheats, luggage, food and ourselves must all be unpacked to access the steaming engine chamber inside the bus. Thankfully help is at hand, and the local children assist the bus driver in sourcing water to cool the engine. The children are happy to be able to help us “Hello” one of them says in a clear accent. “Jambo” I reply much to his amusement. The bus is fixed and reloaded, we board and set off round the corner, two hundred yards later we arrive at the gate. 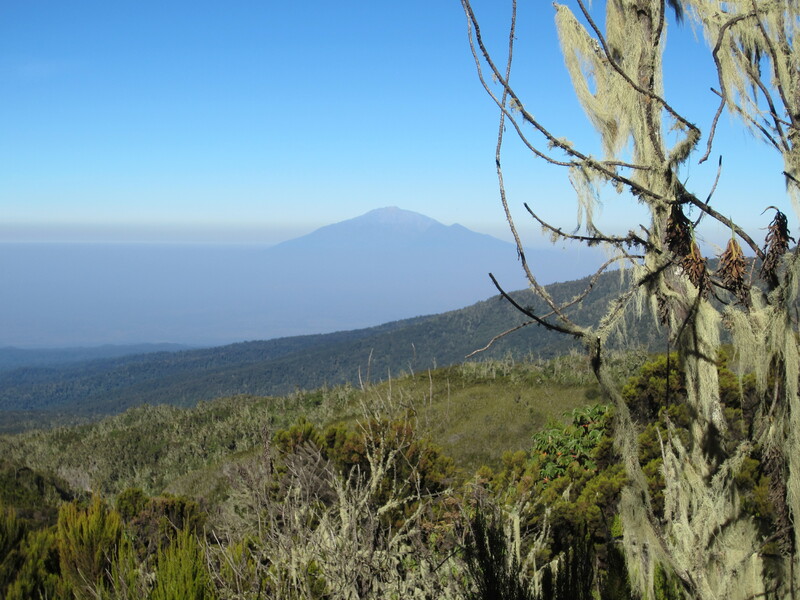 The gates of the kilimanjaro national park have an energy that’s difficult to describe. The small car park is tightly packed with old busses, the porters spring to life and immediately start unloading the tents and equipment from the roof. 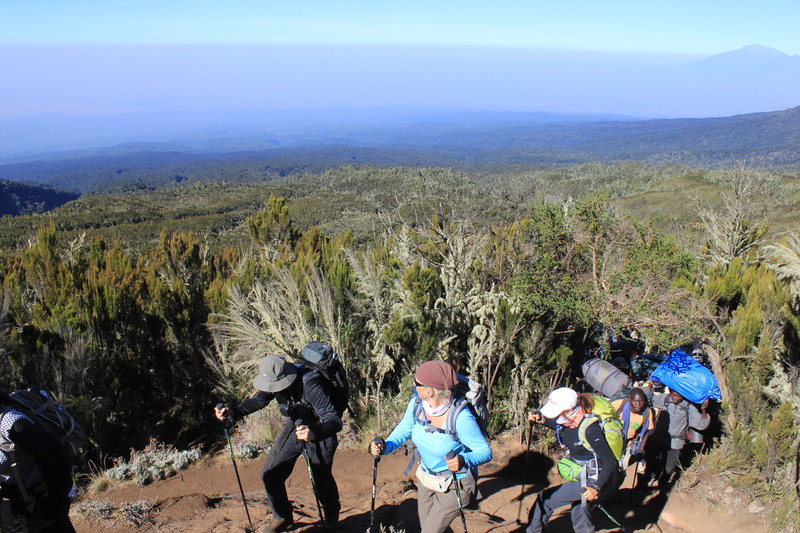 Usually so quiet and peaceful the porters shout at one another in swahili there seems to be a fierce rivalry between our crew and other groups, space is at a premium and vehicles pass each other with just inches to spare. We are taken to the gate office where we sign the register. 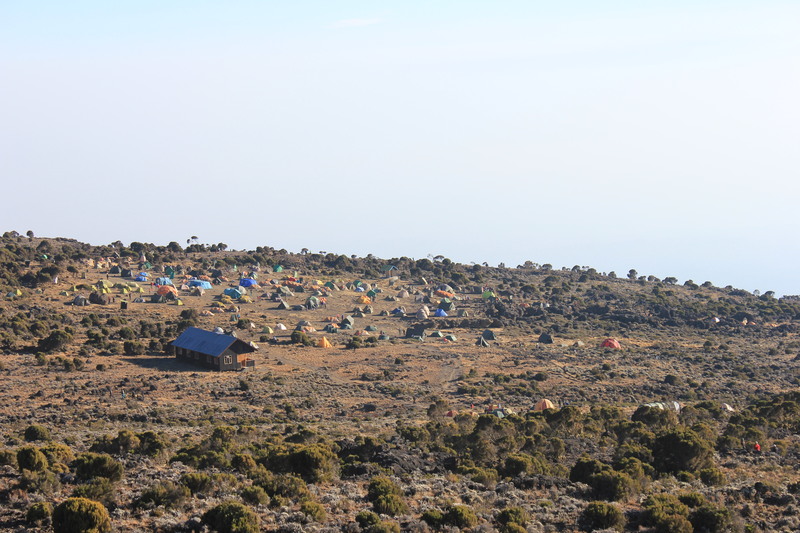 The authorities of the Kilimanjaro national park seem to love their paperwork, at each camp climbers must sign and provide numerous items of information such as age, address, profession etc. At first we take this very seriously but as time progresses we are less accurate with our data, a detailed reconciliation of their records would reveal career changes from Investment Banker, Pilot, Ballerina and Dolphin Trainer all within the week. 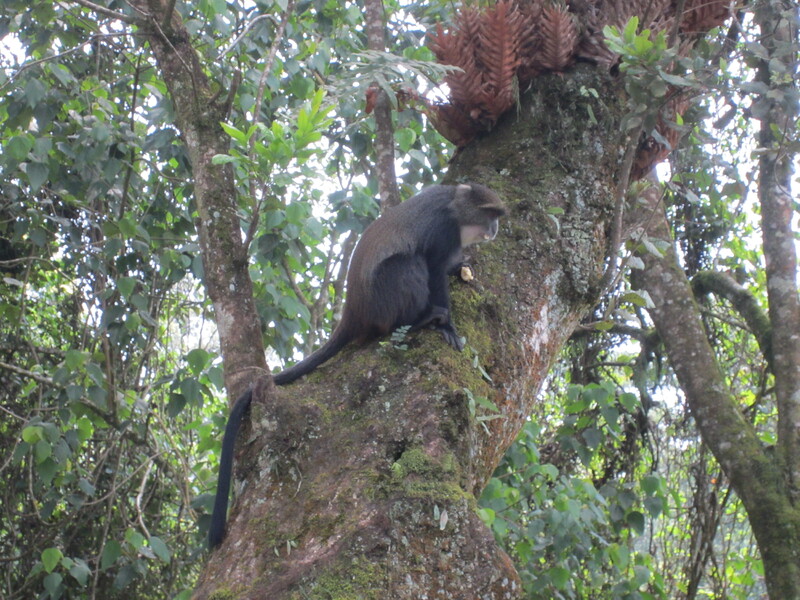 As we sat and ate our packed lunch we watched other climbers feed blue monkeys bananas, I collected $5 from my colleague who was certain that we wouldn’t see monkeys on our first day. We enjoyed a high protein packed lunch, I ponder over my chicken and my egg wondering which to eat first before inspecting the park signs. The sign clearly states that one must be physically fit to start the climb. It strikes me that ‘physically fit’ is a very subjective statement. Despite dieting, 10k runs and numerous gym sessions am I ‘physically fit’? 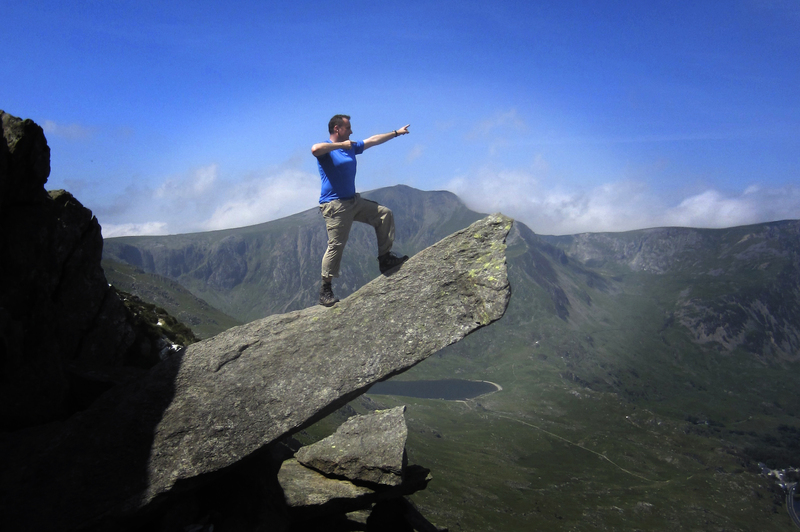 Maybe not by mountain porter standards? At last it is time to start climbing! Our assistant guide Richard leads us to up the track and through and impressive looking gate. The path climbs steeply. From my reading I had assumed that the first day would be easy, a short 7k ramble through the woods, the first few hundred yards were worryingly steep. “if this is easy how steep is the tough bit”? the path quickly disappeared into the woods where a leafy canopy provided welcome shelter from the harsh mid-day African sun. 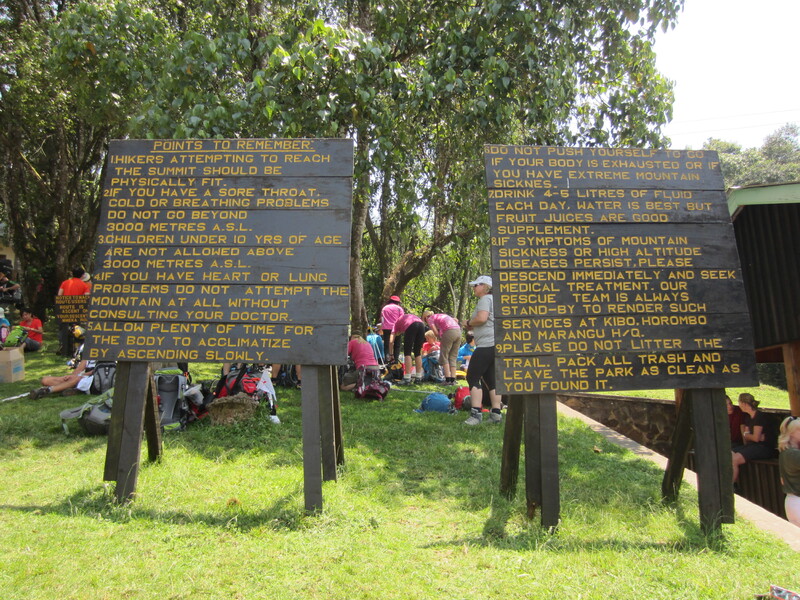 It felt great to be finally walking, and the gradient soon evened out, occasional signs provided the local and latin names of the flora but no more monkeys were spotted. 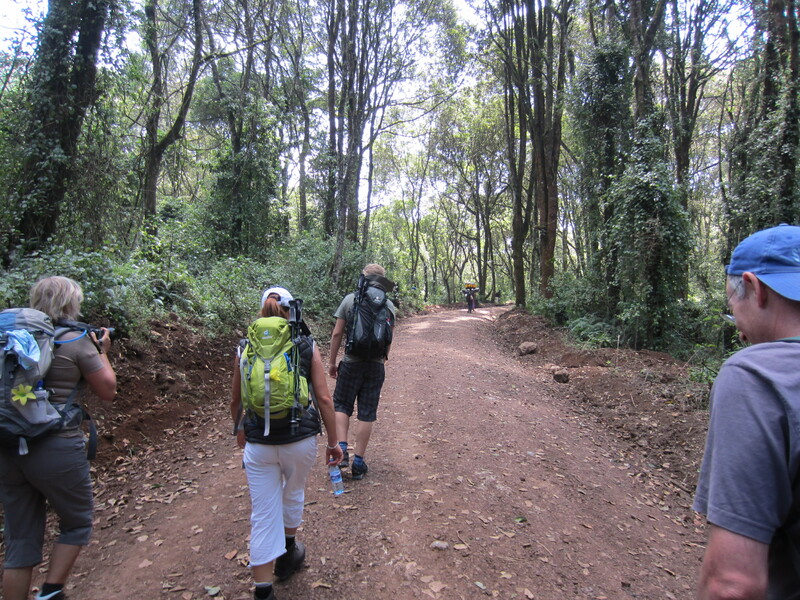 Our pace was steady and respectable but we were soon passed by numerous porters carrying 20kg loads on their heads. “Jambo” each of them greeted us as they passed, despite their loads they all seemed happy and excited about the trek. 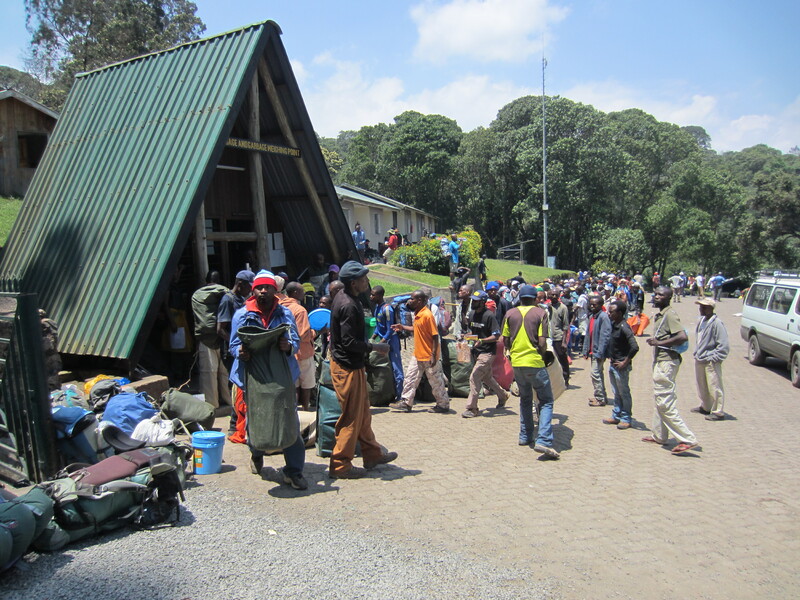 Due to our late start I think we must have been some of the last climbers to leave Machame gate that day which made for a pleasant unhurried climb. We passed some larger groups taking well earned rest stops, teams that we would see again on each day, Macmillan, Citigroup Korean trekking club etc. Whilst the tree canopy provided welcome cover it also blocked all views up and down the mountain making it impossible to gauge our progress. 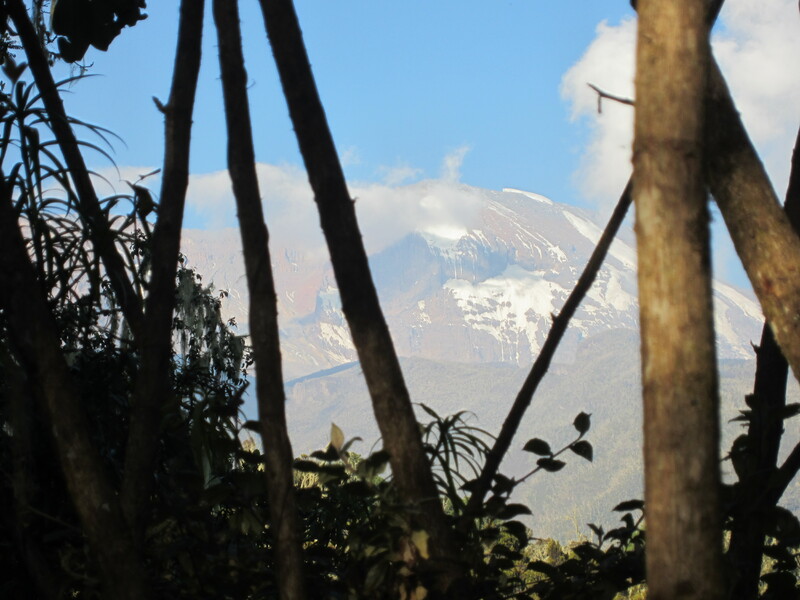 We continued making steady progress up the mountain until finally the tress began to thin and yielded an impressive first glimpse of the mountain, the snow capped peak of Kibo still looking every bit as unobtainable. 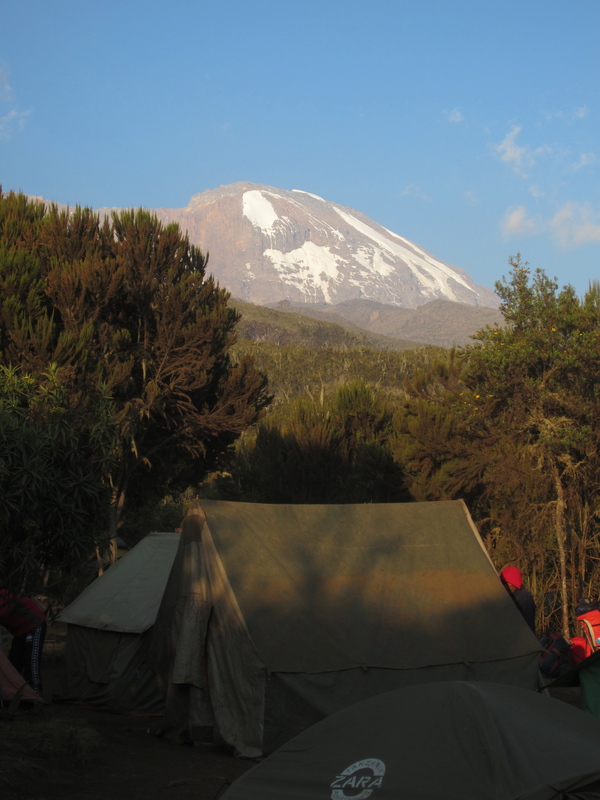 Finally we reach our camp site, Machame Camp. We are struck by just how many tents there are. Our guides inform us that the mountain is unusually busy. Through all our careful planning maybe we weren’t the only ones to have considered the temperatures, dry seasons and full moon. Our tents are packed tightly together, perhaps the most striking thing about the camp is the dust, it’s everywhere a fine powdery dust that clings to cloths and rucksacks. We set out our tent, unpack our sleeping bags complete with silk liners, and make sure we have head-torches close to hand before progressing through to our food tent for our evening meal. Before eating we take our evening dose of Diamox, shortly after I start to lose sensation in my finger tips, despite my gloves and hat I can’t get my hands warm. 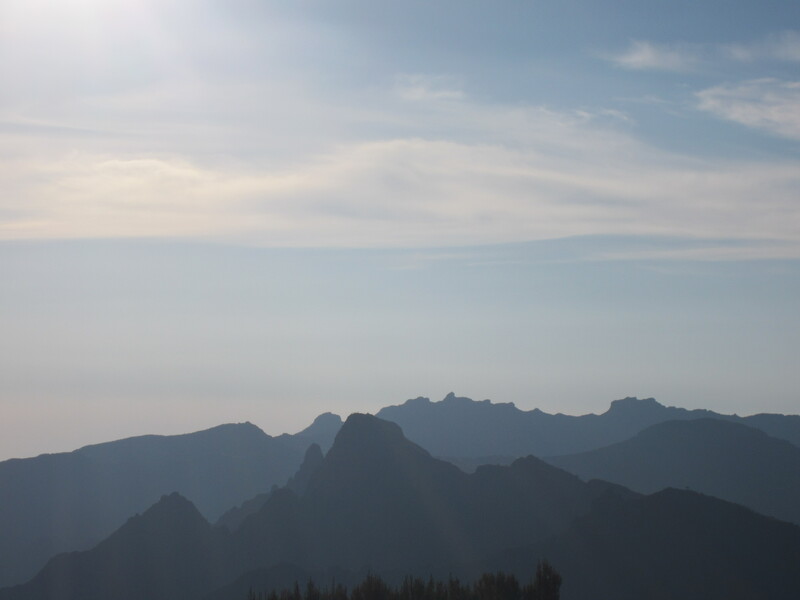 Being near the equator the daylight is somewhat predictable, at 6am the sun rises, at 6pm the sun sets but unlike sea level at sunset the temperature drops suddenly. Overall we’re pleasantly surprised with the quality of the food. Each meal starts with soup. Cucumber, Chicken, Tomato, Pumpkin, they all taste similar yet different. We’re warned that our appetites will decrease with altitude but we must force ourselves to eat. After dinner our guide, Hasbon comes and talks to us. 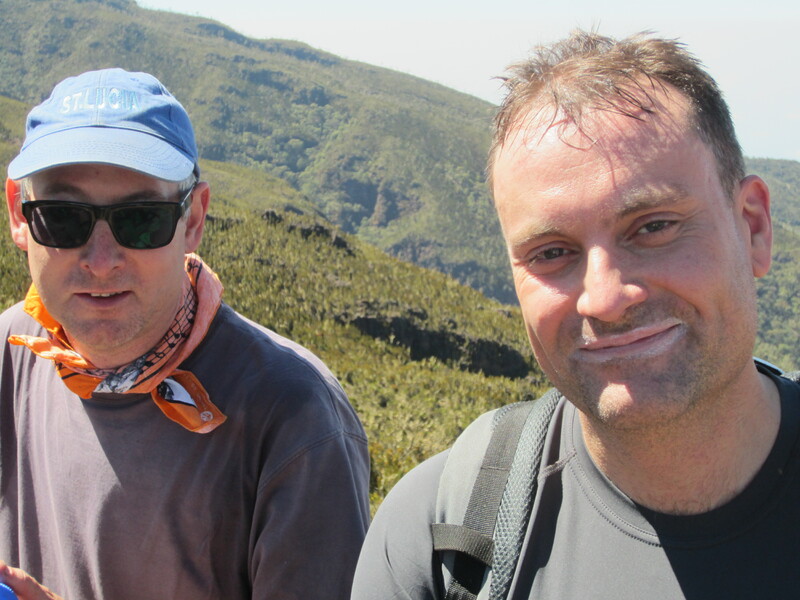 He’s keen to know how difficult we found the days walk, does anyone have a headache? is anyone cold. I explain about my numb fingers “perfectly normal” his confidence puts me at ease and we retire to bed. It seems odd to be getting to bed at 7pm but in truth once the sun goes gown it’s freezing cold and there’s nothing else to do. After 5 minutes of messing about in the tent and deciding what cloths to ware the next day I’m safely installed in my sleeping bag. The neck pillow purchased from Heathrow terminal three is seemingly useless and uncomfortable, I discard this in favour of a down Jacket stuffed inside a dry bag, this makes for the most comfortable of pillows. 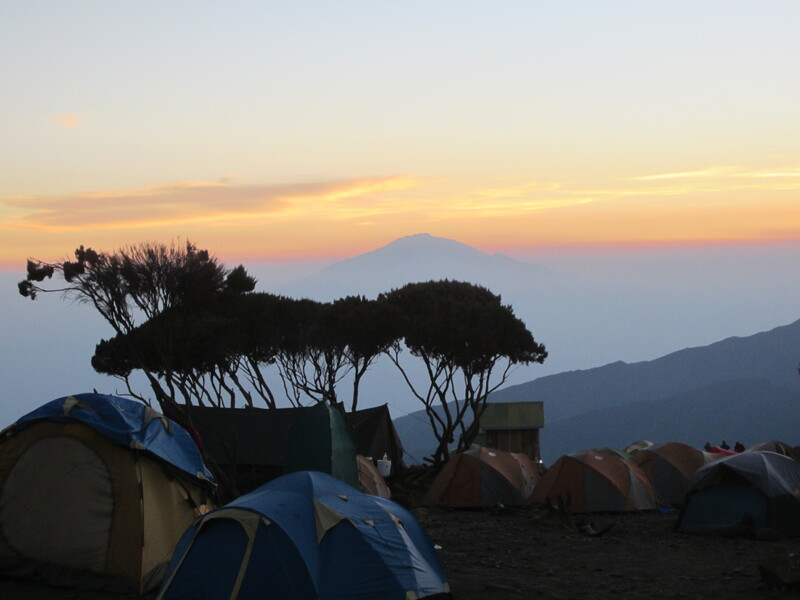 The camp is far from quite with porters and climbers chatting away, as I lay there unable to sleep I realise that I need to get up and visit the our chemical loo. Damn Diamox! 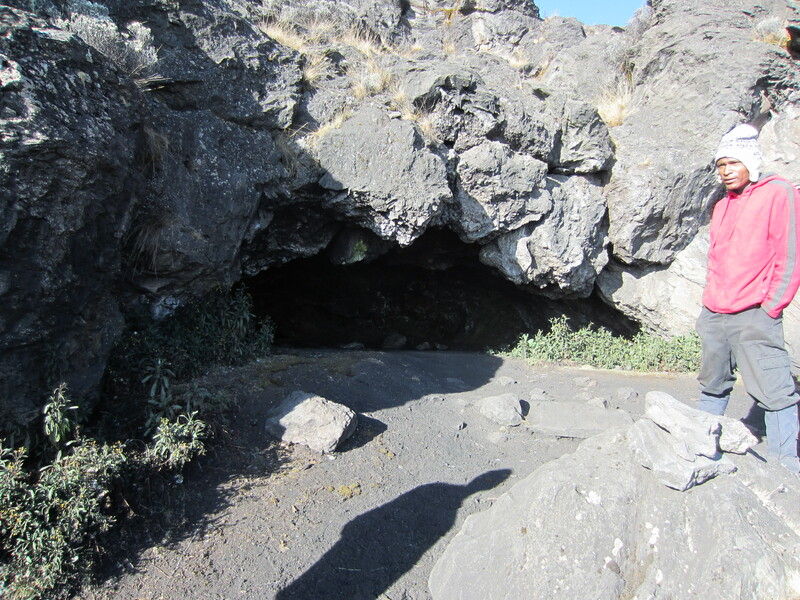 This entry was posted in Kilimanjaro and tagged kilimanjaro, Machame, Machame Camp, Machame Gate on September 29, 2013 by yateschr.